Had a slight blogging intermission this week, as I left my camera in a friend's car for a couple of days. Both pairs of socks are progressing nicely. The green lace ones are on the generous side and with hindsight, could have been a little more snug fitting, but I'm not taking them out now. 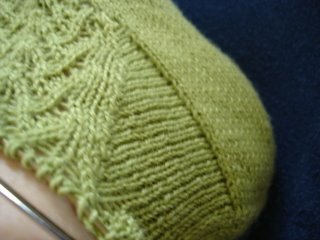 The toe up pattern is ok, but I'm not sure I care for the look of the heel turning. The Koigu Crusoe socks have been taken out and reknit, following Sally's observations when she knit the pattern and found she couldn't get the things over her heel. Catherine, from the NYC SnB list made some suggestions, including the fact that there simply didn't appear to be enough stitches in the pattern - I wonder if the design was "worked down" to require just two balls of this quite expensive yarn? 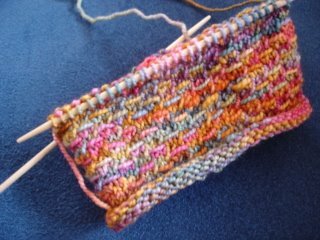 Still, I've cast on 60 stitches this time - more like the usual number - and we will see. They knit up quite quickly so it won't be quite the disaster if I have to unpick. But I shall try them on at every stage, just in case. There will not be much knitting tonight, however. 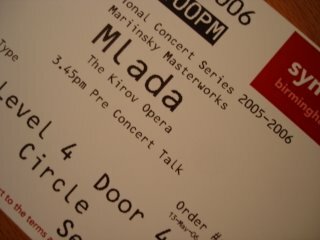 We have tickets.